The NASA Innovative Advanced Concepts (NIAC) program recently awarded 25 grants for the development of visionary new technologies. Here we’re going to take a closer look at two Phase I awards focused on surface operations on other worlds. A turtle carries its own habitat. While it is reliable, it costs energy. NASA makes the same trade-off when it transports habitats and other structures needed to lunar and planetary surfaces increasing upmass, and affecting other mission goals. Imagine a self-pitching habitat made of a light, fibrous material, with excellent mechanical properties. The material could be used dry, wet, frozen with water or as part of a self-produced composite which could allow such enhancements as radiation protection and a vapor seal. It is self-replicating so the habitat could be extended at a future date, and self-repairing. Some form of this material could be used for a habitat at destination, additional buildings, the shell of multiple rovers and furniture. The fibrous material is fungal mycelium, the vegetative structure of fungi consisting of branching, thread-like hyphae. Mycelial materials, already commercially produced, are known insulators, fire retardant, and do not produce toxic gasses. Metrics for these materials show compression strengths superior to dimensional lumber, flexural strength superior to reinforced concrete, and competitive insulation values. As mycelia normally excrete enzymes, it should be possible to bioengineer them to secrete other materials on demand such as bioplastics or latex to form a biocomposite. Mycelia are more flexible and ductile than regolith alone. As a standalone material or in conjunction with agglutinated or sintered regolith, a mycotectural building envelope could significantly reduce the energy required for building because in the presence of food stock and water it would grow itself. After the arrival of humans, additional structures could be grown with feedstock of mission-produced organic waste streams. Melanin-rich fungi have the ability to absorb radioactivity suggesting that melanized fungal mycelia could provide radiation protection. Lead found in the regolith, or other radiation blocking materials such as water could accumulate in the mycelia providing additional radiation protection. When protected, the mycomaterials can have a long life, but at the end of its life cycle the material could be become fertilizer for mission farming. Our concept fits within the Mars DRA 5.0 ‘commuter’ scenario, with the major difference being that the habitats and the shells of the rovers would be built at destination. 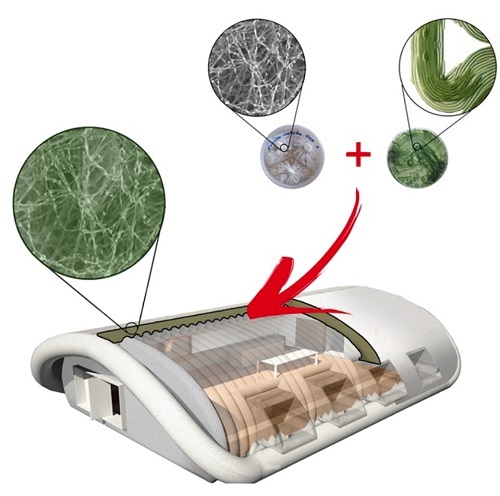 On Earth, a flexible plastic shell produced to the final habitat dimensions would be seeded with mycelia and dried feedstock and the outside sterilized. At destination, the shell could be configured to its final inner dimensions with struts. The mycelial and feedstock material would be moistened with Martian or terrestrial water depending on mass trade-offs, and heated, initiating fungal (and living feedstock) growth. Mycelial growth will cease when feedstock is consumed, heat withdrawn or the mycelia heat-killed. If additions or repairs to the structures are needed, water, heat and feedstock can be added to reactivate growth of the dormant fungi. The proposed work focuses on filling select key technical knowledge gaps such as the temperature range of mycelial growth, radiation protection, potential for algal feedstock and enmeshed biosensors, mass of inputs and finished product, and material properties of the materials. The potential for enhancing structural and sensing capabilities by the incorporation of the bacterium Bacillus subtilus, is novel. Architectural design concepts based on this vision will be examined for use in a mission context including mass trade-offs, and temperature inputs, as well as suggesting new terrestrial routes to infusion where rapidly built, lightweight structures are desired. If successful in developing a biocomposite material that can grow itself, NASA will have a radically new, cheaper, faster lighter material for designing habitats for extended duration lunar missions, Mars missions, and mobile habitats as well as furniture and other structures. No parameter in the design of spacesuits for planetary exploration is more important than “weight on the back”: the weight of the suit system which must be supported by the wearer under the gravity of the Moon or Mars. The added weight of the spacesuit garment andportable life support system (PLSS) drives the required exertion level of the wearer, and ultimately sets limitations on EVA duration, distance traveled on foot, and productivity of the exploration mission. It is clear that planetary surface exploration activities would be greatly improved if the astronauts did not have to carry a PLSS to maintain life support functions. At the same time, additional restrictions on crew mobility, limits of access, and operational capabilities would be unacceptable. The concept for this NIAC proposal is to accomplish these two seemingly conflicting requirements through the application of advanced robotic systems to deal with biological requirements (i.e., life support) for the astronauts: the ‘BioBot’. The design reference scenario for this concept is that astronauts involved in future lunar or Mars exploration will be on the surface for weeks or months rather than days, and will be involved in regular EVA operations. It is not unreasonable to think of geologists spending several days in EVA exploration each week over a prolonged mission duration, with far more ambitious operational objectives than were typical of Apollo. In this scenario, each astronaut will be accompanied by a ‘BioBot’, which will transport their life support system and consumables, an extended umbilical and umbilical reel, and robotic systems capable of controlling the position and motion of the umbilical. The astronaut will be connected to the robot via the umbilical, carrying only a small emergency openloop life support system similar to those contained in every PLSS. 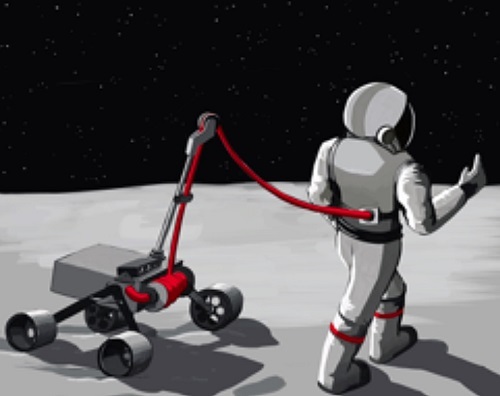 The robotic mobility base will be designed to be capable of traveling anywhere the astronaut can walk, and will also be useful as a transport for the EVA tools, science instrumentation, and collected samples, and potentially carrying the astronaut on traverses as well. Such as system will also be a significant enhancement to public engagement in these future exploration missions, as the robotic vehicles can provide high-resolution cameras and high-bandwidth communications gear to provide high-definition video coverage of each crew throughout each EVA sortie. There are also architecture-level benefits to this concept. For example, in the drive to reduce suit weight to the absolute minimum due to the load of the PLSS, design elements which would enhance suit mobility (such as rotary bearings) are frequently deleted, resulting in a lighter but less flexible suit enclosure. By offloading the life support system electrical power, and consumables, the relatively meager increase in garment mass to incorporate these mobility features would be easily accommodated, resulting in not only a lighter, but also more flexible spacesuit system with an overall center of gravity very close to that of the wearer’s body. Since the PLSS weight restrictions would be negated by placing the system and its consumables on an accompanying robot, the overall EVA system could easily adapt to longer sorties, higher capacity astronaut cooling systems, or higher levels of redundancy to enhance crew safety and minimize the possibility of a loss-of-crew event. When no longer constrained to fit within the mass and volume constraints of a spacesuit backpack, portable life support designers can consider technology alternatives better suited to extended exploration, such as radiators for cooling, solar panels to extend electrical power, or regenerable CO2 scrubbing systems. I think both ideas are very, very powerful. Probably we will see in the future these developments. I wonder how long it will take before the biobot is modified to allow the astronaut to ride it?